No, your eyes aren’t deceiving you, and this isn’t a doctored photo. 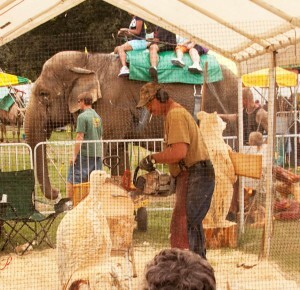 ?You are in fact looking some dude “carving” sculptures of turkeys and bears with a chainsaw, while kids are riding an elephant in the background. ?Welcome to New Jersey. Specifically, welcome to the New Jersey State Fair, also known as the Sussex County Farm & Horse Show, held every fall. ?Indeed, most people who don’t live in NJ think the place is only smokestacks, garbage dumps and Mafia families. ?But believe it or not, we actually have trees and plants! ?And Farms! ?With real animals! This fair actually melds a lot of different state pastimes together: old style carnival rides and attractions, “shore food” (even though it’s not near the shore), and agriculture. This is the place where all the city slickers and suburbanites can see the more rural side of the state. There was also plenty of random stuff too. There were robots (yes, robots!). there was an old beekeeper who kept getting stung by his very angry bees. And various random but interesting farm equipment. Update: Sorry folks, minor glitch. The photos now really do exist after the cut! With the end of summer well upon us, my significant other and I recently headed to Cape May, NJ for a weekend to enjoy the last good-weather weekend of the year. ?For all the flack New Jersey gets, there really are some incredibly nice places to visit in the state, and this little resort town is definitely one of the nicest spots I’ve ever been to. The weekend we visited happened to coincide with some kind of outing by a local club of Chevy Corvair enthusiasts, which allowed me to get the nice retro-shot seen above. ?In general, everything just seemed to kinda fall into place there, and just about every picture I too came out looking somehow awesome. Of course now, the weather is colder and the town has pretty much battened down for the winter, though there are still a couple of bed & breakfasts and wonderful eateries in the area that might be worth a visit in the off-season. 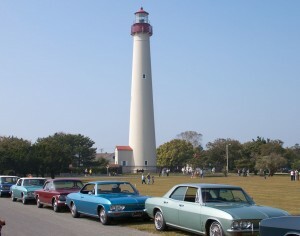 The area’s most notable landmark though, is its lighthouse and the nearby park and beach. ?The photos after the cut tell the story of that awesome-looking area.